This success probably supported other releases including two novels published in Hong Kong in 2010, “The fall of the pagoda” and “The book of change” and two months ago, “Half a lifelong romance” (4), her most popular novel, translated by Karen S. Kingsbury and published by Penguin. Manzhen is an energetic young girl who, after her studies and the death of her father, had to work in the administration department of a factory in Shanghai. She meets two young engineers, Shijun, son of a wealthy family and his friend Shuhui. Manzhen and Shijun will fall in love but Shijun, introverted and too respectful of traditions, is reluctant to decide their marriage because of the rather negative reaction of his family who has other plans for him. These quarrels between lovers will be used by Manzhen’s family. Her sister Manlu sacrificed studies and an engagement to support her family after her father’s death and lives with a speculator, Hongstai, very impressed by Manzhen’s charm. With the help of Manlu he rapes Manzhen who will remain during a year locked up at her sister’s place with the tacit approval of her mother. Shijun, deceived by the mother and the sister, can not find her, thinks she got married and returned to Nanking in his family who managed to have him marry the one they chose. This novel the original title of which was “Eighteen Springs” was published under a pen name and serialized in 1950 in a Shanghai review controlled by the Communist Party. In 1969, Eileen Chang lives in the USA and releases a new version of the novel entitled “Half a lifelong romance.” The novel released in 1950 has a “revolutionary”ending: the characters come together and use their energy to rebuild the country. The book, adapted by Eileen Chang, is, as explained by the translator in her preface, much more in line with her pessimistic approach and far from the revolutionary ambitions. Instead of eighteen years, the novel runs from 1931 to 1945, making it possible to avoid mentioning the beginning of the civil war and the leadership of the Communist Party. The novel is totally focused on the psychological approach to the characters and only the take over of Shanghai by the Japanese in 1937 allows the author to introduce the environment of this period. No complacency for the Japanese but without praising the action of the Communist Party, because she will later be very critical in her two novels written in English in Hong Kong, “The rice sprout song” and especially “Naked Earth” (the novel will be reissued by New York Review of Books in March 2015). 3- A melodrama of course, but what a talent! As in other novels by Eileen Chang, it is the impact of the tradition which sometimes can crush people and lead them to their doom. These are most often women who are victims and men do not often have women lead a happy life. In this book, the relationship between the two sisters, Manlu and Manzhen is one of the attractions. Manlu, to support her family and to pay for the education of her sister, became a hostess in a nightclub which broke her engagement to a young doctor, Yujin. When she married Hongstai, her mother thought that Yujin could be a good match for Manzhen. Manlu sees herself betrayed in her memories and her attitude towards her sister is changed: “I have-been good to her … and this is how she repays my kindness. Never a thought for what I’ve done for her. For whom did I sell my youth if not for her? (p.145). Manlu is sterile after two abortions, realizes that Hongstai is running around and that a solution could be Manzhen: “all she needed was someone to bear the child for her. Why not her younger sister? She was the one Hongstai wanted. And as her younger sister, she’s been easier to keep under her thumb “(p.121). Manzhen will not be protected by her mother on the contrary. Mrs Gu, who lives partly with funds from Manlu, sees only one solution for the future of her daughter who has been raped, to be the concubine of Honqstai and to achieve that with Manlu, they will deceive Shijun. As Shijun’s mother, Mrs Gu with good conscience will handle the misfortune of Manzhen with only one concern, avoid loss of face … It’s a classic theme in Chinese literature, such as in Ba Jin, but mothers here are particularly evil. The plot often progresses with the help of chance and meetings by accident; chance can help a lot, but sometime it is a bit hard to believe. This is one weakness of this text as well as some rather unnecessary side characters (like Yipeng). Similarly the chapters of the first quarter of the novel, as is often the case, lack a bit of energy. 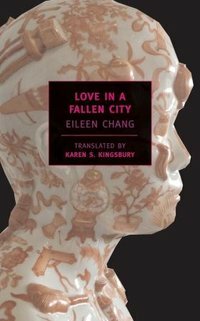 In short, one can prefer the brilliant novellas (such as these of 1943) or the very dark autobiographical writings as “The fall of the pagoda,” but the talent of Eileen Chang should be praised for her first “long” novel. This book is read with pleasure and his success is legitimate. The book’s success was reinforced by adaptations in film and television serials. Ann Hui, a filmmaker of great talent, adapted in 1997 “Eighteen Springs” in Hong Kong (after shooting a good movie from the popular short story “Love in a Fallen City” in 1984). 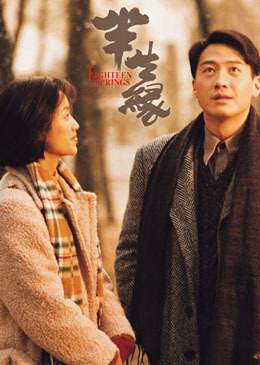 Despite the film’s title, it is the 1969 version of the book “Half a lifelong romance” with famous actors Leon Lai in the role of Shijun, Anita Mui in that of Manlu and Jacky Wu as Manzhen. In 2003, a television series of 35 episodes “Affair of Half a Lifetime” is also a great success with Taiwanese actress and singer Ruby Lin. One should be pleased that this good novel is published in a collection as prestigious as Penguin modern classics but also one can regret that no longer further books of an author as remarkable as Eileen Chang are translated into French and yet the first translation, that of “Rice sprout song” has been released in … 1958 with Calman-Levy …! (1) Eileen Chang, “Love in a Fallen City”, translated by Karen S. Kingsbury. New York Review Books (2007) (Also includes “The golden cangue”). (2) Eileen Chang, “Un amour dévastateur”, translated into French by Emmanuelle Péchenart. Editions de l’aube, 2005, 120 pages. 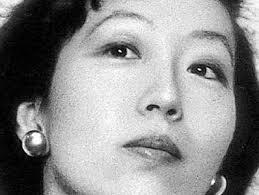 (3) Eileen Chang, “The Golden cangue”, translated into French by Emmanuelle Péchenart. Bleu de Chine, 105 pages, 1999. 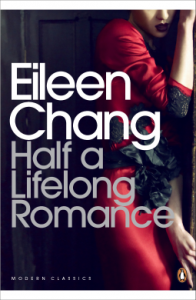 (4) Eileen Chang, “Half a lifelong romance”, translated by Karen S. Kingsbury. Penguin modern classics, 380 pages, 2014.